Things fall apart pretty quickly for Aphra in Star Wars #31 as the queen tries to double cross her and Luke. Force powers and allies are short on hand as both take their time in coming into play. But it does provide for some action. This shot of the “monsters” is pretty cool. 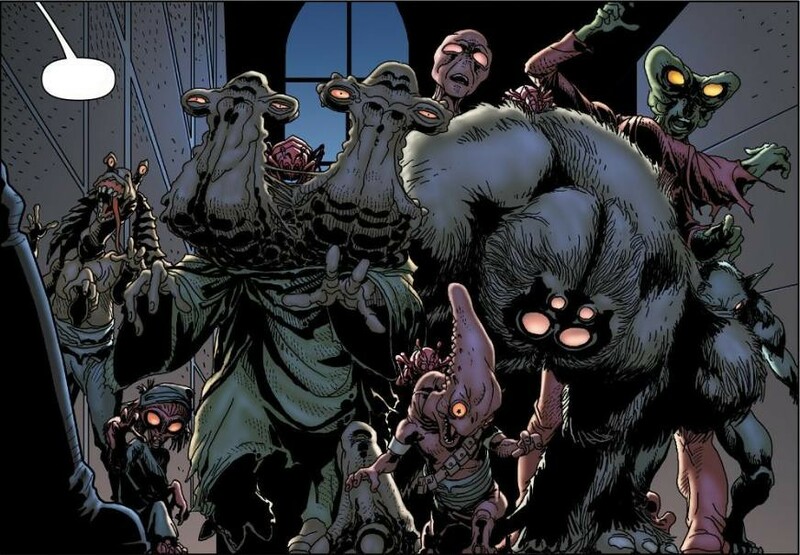 It shows off some well known aliens, puts a weird horror take on them, and the art style works well with the comic. I love this shot of the queen. In fact I think I like Larroca’s take on the queen better than what we saw in Screaming Citadel #1. The issue starts off on Horox III as the writers continue to draw out the whole scorned ex-lovers plot with Sana and Aphra. It still hasn’t been officially declared, but it’s getting insinuated to the point of irritation. I really don’t know why they’re dragging it out this far as it’s not going to having any pop value when they finally come out and say it. Right now it just makes Sana see bullheaded and closed off as she keeps her allies in the dark. Regardless, Sana fills in Han and Leia on the queen as they’re off to rescue Luke. Back on the Citadel of Ktath’atn, we learn the name of one of the queen’s lieutenants, Bombinax, and we catch a glimpse of Krrsantan which promises a possible duel between the two. The rest of the issue is dominated by Luke and Aphra’s breakfast with the queen. Great close-up shot of Luke and Leia. Notice how this style differs from the shots that follow. There’s a lot of dialog in this issue, and for the most part, it’s entertaining. There’s a lot of back and forth quipping between Aphra and Luke, but we don’t get much out of the queen. There’s a few bursts of action here and there, a little bit of story development, however the primary purpose of this issue is the positioning of the characters. 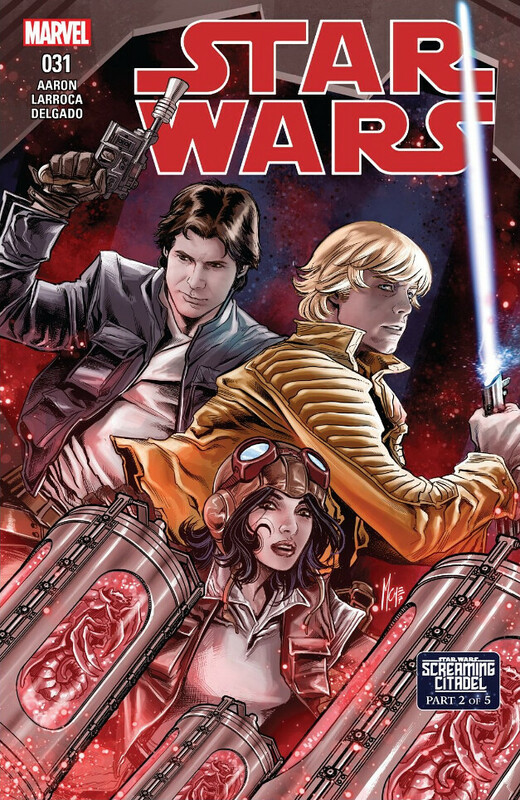 It puts Aphra and Luke inside the queen’s citadel and under attack. It puts Krrsantan in confinement with impending violence, and it brings Sana, Han and Leia to the planet and into a confrontation with Triple Zero and BT. At the issue’s end, everyone is on the planet and the action is ready to ignite for all of them. There’s just enough dialog and action to keep the issue entertaining as it gets to that point. Yet the question is, is it satisfying? To an extent, yes, but it definitely had room for improvement. Here’s some different shots of Han. I think one of the things that gets me is how the coloring of the face seeps into the eyes. The other thing that gets me is just the way Han looks in the last panel. It reminds me of the style used by artist Richard Corben. Some more shots with the odd coloring/shading of the faces. The artwork is interesting as Screaming Citadel Part 2 is very different from Part 1. The art teams on both issues have different styles, which makes this one a little jarring and a little interesting. On one hand, Salvador Larroca has some neat takes on the characters. On the other hand, it’s inconsistent from the visuals we were provided in the initial issue. Personally, I like visual continuity when reading a story arc in a comic series, and while Luke and Aphra still look like each other, the change with the queen’s appearance is what bothered me most. Both artists illustrated a cool looking character, she just looks distinctly different between the two issues. The other thing that bothered me with Larroca, and possible Delgado’s coloring, is how some of the realistic takes on the character’s faces jars with the style and coloring of the rest of the artwork. For instance, if you compare Luke, Han or Leia to the queen’s face, there’s a very different style being employed with artwork. 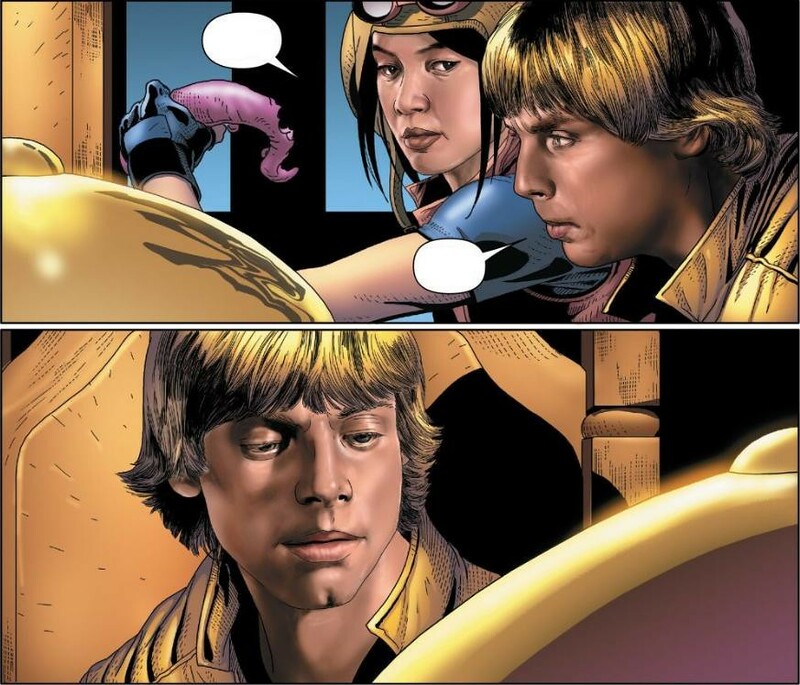 The coloring and shading of Luke’s face is kind of odd. It’s details, somewhat life life and conveys a good sense of texture and dimension, but there’s something about it that also looks wrong and alien. 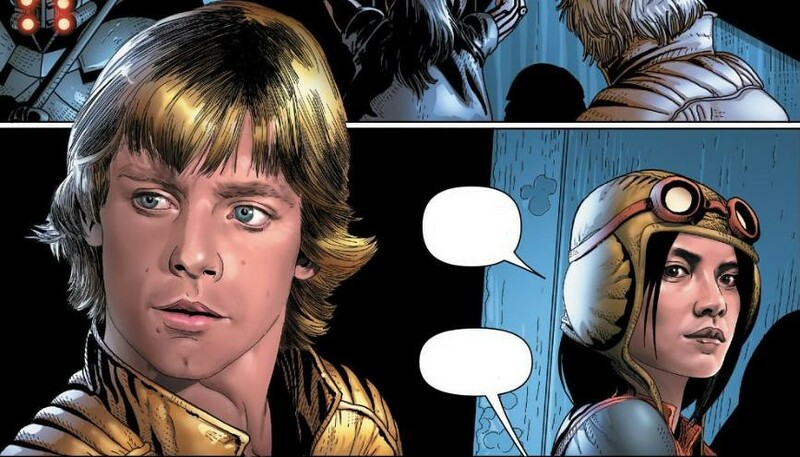 It’s not like that in ever panel, and it’s not just Luke. Sometimes it’s Aphra. Most notably, it shows up with Han in the last panel. Whatever it is the art team is doing, it’s not working for me there. Yet some of the panels and close-ups are great. The inconsistency of the artwork adds to the jarringness of the whole thing and hurts it a little. Here the faces look good. I think the shot of Aphra is great. It captures her emotion and it doesn’t look off putting, though it’s still utilizes that same kind of style, it works better in the lower light of this panel. When this style is used in a brightly lit panel, the faces look too dark. Overall, this issue isn’t bad, but there are some things that could have been better. That said, I’d still give it a four out of five metal bikinis. While there isn’t a lot of wow factor yet, the entertainment factor is still there.